Lattice Engines’ product SalesPRISM use machine learning to predict the size of a deal, and likelihood of a sale converting, in the process making for a smarter, more productive Sales Team. SalesPRISM does this by analyzing large amounts of data to determine a customer’s intent. This data is sourced from many sources both internally, like CRM, Marketing Automation, and legacy databases, and even externally from websites, and social media. It then provides Sales with suggestions for the right talking points to use when calling customers, what to cross-sell, how big a deal to expect and what products the customer is most likely to purchase. This kind of intelligence allows Sales Teams to spend more time selling than preparing for a sales calls. It enables more personalized interactions, and even shortens the ramp up time for new Sales Reps on the team. In this video, Lattice Engines CEO, and Co-founder, Shashi Upadhyay discusses the shortcomings of CRM and MAS systems, and how Lattice Engines fills this gap. In technical terms, Allazo Health is a solution for medication non-adherence. In simple words, it uses predictive analytics to both anticipate which patients will not take their medications and to determine the most effective interventions to influence each of those patients to take their medication. This intelligence is sought after by health insurance providers, pharmacy benefit management companies who want to reduce costs, have fewer readmissions, and an overall improvement in patient health. In the first post in this series, we discussed how predictive analytics is becoming more available to businesses, and is no more the way of the analytics ninjas. Context Relevant is one company that’s breaking new ground in this direction. It offers predictive analytics solutions to businesses without the need for extensive teams of data scientists. Context Relevant uses real-time data from HDFS, SQL, web logs, CRM systems, market data and social media to output analyses and projections on how a business might be impacted in the future. There are currently three solutions in the startup’s behavioral analytics library — banking and finance, web context personalization, and online travel. In an interview, Stephen Purpura, CEO & Co-founder, cites an example of how Context Relevant takes weather data, government data, and demographic data for a particular area, and analyzes it so a company like BestBuy can predict how many video games they’ll sell based on these conditions. Context Relevant claims to be “the world’s fastest predictive analytics application.” The opportunity for them seems ripe given the disparity between supply and demand for data scientists today. Parse.ly’s product Dash is a content optimization platform for publishers which enables them decide what types of content to publish. It does this by analyzing billions of pages across the Web, allowing publishers to track the performance of authors, articles, and topics in real-time. It gives publishers recommendations for what topics to cover, and allows them to capitalize on trends before they take off. All of this comes together to inform the content strategy of a publisher. While all the companies mentioned here are just starting up, the enterprises too want in on the action in predictive analytics. This has resulted in a slew of acquisitions in the past year, a few of which we’ve listed below. 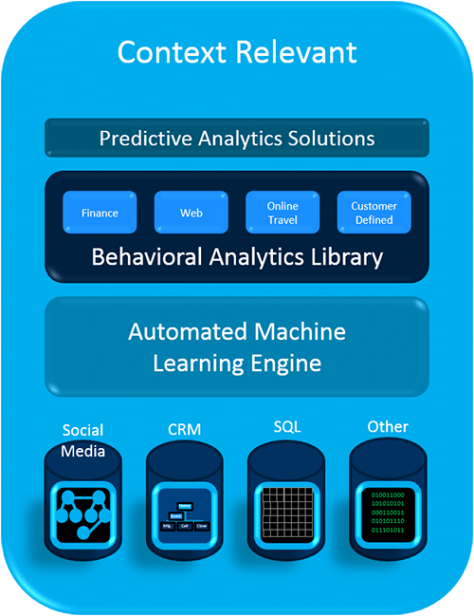 Salesforce acquires Prior Knowledge to boost its predictive analytics capabilities. Not just the technology, but the team from Prior Knowledge is expected to be a key influencer as SalesForce responds to startups like SalesPredict and Lattice Engines. Walmart Labs acquires Inkiru to help their data scientists work with big data, and improve Walmart’s site personalization, search functionality, fraud prevention and marketing initiatives. Just this past week, SAP acquired KXEN to boost their on-premise ERP applications, as well as their SaaS portfolio and HANA in-memory database. That’s a wrap for this post. I really have to tear myself away from writing more, as there are so many companies to include that even these 2 posts don’t do justice. But I hope that all these examples combine to give you a sense of the immense potential, cutting-edge innovation, and surprisingly valuable results that predictive analytics is delivering to businesses across the board. And just maybe, this would spark some inspiration for you to consider applying predictive analytics at your company at large, or a particular business function you’re in. In the next post in this series, we’ll take a look at how predictive analytics systems visualize the data, which is the important last leg in the entire process. Do subscribe to our blog to get these posts delivered to you via email.